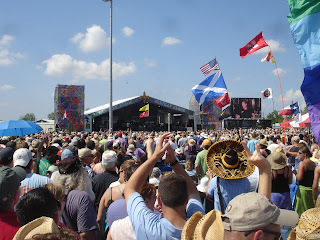 Jazz Fest: A six-day music festival (split between two weekends) with everyone from Harry Connick Jr., Counting Crows, John Mayor, to Galactic, Norah Jones, and Van Morrison. But don't get me wrong. The festival is not only about music. It's about shopping, with booths like the African-heritage Congo Square or the Louisiana Marketplace with local folk art (where I bought a cowboy hat to shade my face from the strong Southern sun!). And, it's also really about food: pulled pork po-boys, alligator pie, muffuletta, crawfish, fried chicken, and the most refreshing mango sorbet ever. So, really, Jazz Fest is about New Orleans culture. 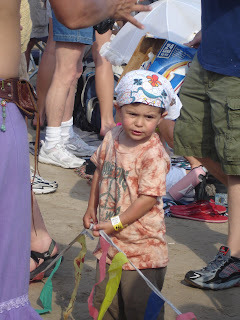 The cajun-influenced flavors, the foot-stomping blues, the Louisiana sun beating down, and of course, cute little festival babies like the one above. Unfortunately, we pulled into New Orleans too late on Friday to see the likes of George Benson or ZZ Top, but it was actually for the better. Friday was drenched in a serious rainstorm that had festival-goers up their ankles in water. Shelter couldn't even be sought out under the blues tent or the gospel tent, the water was just as high. Saturday turned out to be one big mud-fest. Those who had taken a rain-check on Friday, made their way to the festival on Saturday making it one of the most crowded festival days in history. But, the more the merrier, right? 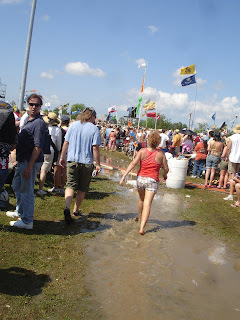 The fields were so muddy, some people wore their galoshes, while others just traipsed through the mess. Around two, we went to check out Buckwheat Zydeco. Then onto New Orleans-natives Cowboy Mouth which drew a crowd so large there was no moving forward, even from way back. I saw Cowboy Mouth in New York City only months before--the show was great but nothing like seeing them in their hometown. On our way to Galactic, we got sucked into the Stephen Marley with Junior Gong show. We danced as Stephen Marley sang his father's Iron, Lion, Zion and I am almost positive it was what being at a Bob Marley show is like. And, although I tried to convince a group of eight guys to go watch John Mayer, I didn't win that battle and we sat on the lawn to catch the end of the Allman Brothers' Melissa. For a mere price of around $35 a day, Jazz Fest is definitely worth a trip to New Orleans. Not only does it support the local economy, it brings in some legendary musicians. Not to mention, some damn good home cookin'. 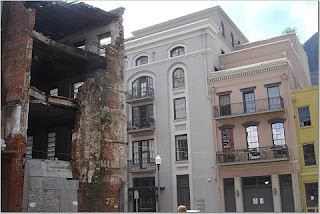 The French Quarter: New buildings alongside Katrina's path. People eating on their balcony. A train along the Mississippi River. 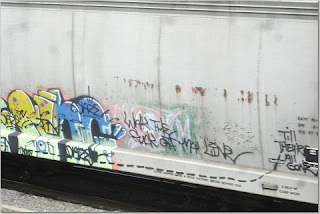 Some choice words. 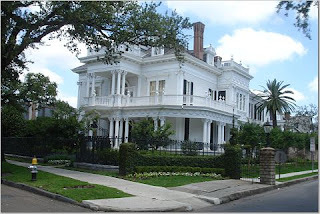 A palace on St. Charles Avenue. 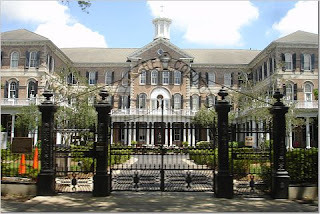 At the end of St. Charles Avenue. Is this slogan referring to Katrina? 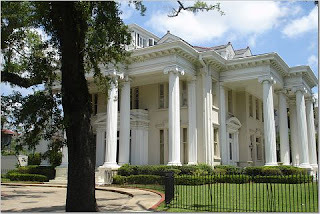 A proper Southern home on St. Charles Avenue. Labels: architecture, Drive, Garden District, houses, Hurricane Katrina, New Orleans, Photography, Scenic Route, St. Charles Ave.
Two-thousand nine-hundred miles to go. We're heading south on I-81 and I've never seen more farmland, more Amish-country, mustard field, grassy rolling hills into red barn farmland. I'm practically waiting for a buggy to roll by. Pennsylvania must be the most beautiful state I've ever seen. Ian and I are driving towards North Carolina in Ian's red pick-up truck, our stuff bulging out in every direction, a kayak, bike, and cooler all strapped down to the roof of the cap. And, now, with this farmland in front of me, I've never wanted to stick my hands in moist, rich soil as much as I do now. It is exactly how John Grogan describes it in NY Times Bestseller Marley & Me (an endearing book about a young newspaper journalist and his chaotic yellow lab). Over the next few hours we cross through Maryland, West Virginia, Virginia, Tennessee and into a leafy, almost rainforest-like North Carolina. The farther south we go the greener it gets--as if winter never touches these humid, soggy places. In Virginia, we pull off for dinner at an unassuming intersection with an Applebees and a Waffle House catty-corner to each other. Our choice? 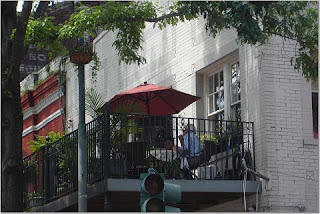 Mrs. Rowe's Restaurant—a plantation-like restaurant, with home-cooked perfectly battered fried chicken, warm, baked apples with hints of cinnamon, savory spoon bread (a rice pudding-textured corn bread that is salty and sweet and feels so good sticking to your tongue and your teeth), and proper Southern sweet tea. It isn’t until after dark when we pull into the Great Smoky Mountains National Park, rain pelting us from above a canopy of giant trees. Because the park is sliced down the middle by the Tennessee/North Carolina border, the exact state our tent is pitched in is still in question, but the babbling brook nearby lilts us off to sleep—even if the ground we are sleeping on feels like the hardest slab of slate ever. I tell Ian I want to take a walk in the morning, check out some of the looming park nearby, but in a tired state of thoughtlessness, Ian locks his keys in the car. Calling AAA is proving to be a feat up here in the mountains, and soon a crowd of fellow camping guys has gathered around the car, sticking knives and sticks and antennae into the crack in the door to jimmy it open and telling jokes in thick Southern slurs. It is a miracle when Ian manages to jab his antennae onto the unlock button. We drive through the Appalachians for a while, winding past a boulder-filled riverbed in which the water level is too low for swimming. We pass through Maggie Valley, a small mountain town with storefronts that tout one tourist attraction after another—Ghost Town in The Sky, All-American Transportation Museum, Blue Ridge Gem Mine. It’s hokey here, but beautiful, and kids don’t seem to notice cheesy anyway. We pass through a Cherokee Reservation, with storefronts touting moccasins and Kachina dolls and I am reminded of a Kachina doll I once had, whose long, black eyelashes lolled up and down when I moved her. We pass the 1996 Olympic’s White Water Rafting Course and Ian tells me this it the white water capital of the U.S. and I believe him. Every building we see is another adventure company guiding trips down the Ocoee River. Gates are set up through each rapids course for more technical trips. Heading south on I-81 again, we have a destination in mind: Dreamland BBQ, a restaurant I read about in Travel + Leisure. After descending out of North Carolina, we pass through a leafy Georgia and into sweltering Alabama. We pull off the highway in Tuscaloosa, a honey-suckle scented backwoods neighborhood of Alabama where mouth-watering Dreamland is located. On your way to Dreamland, your nose will tell you if you are headed in the right direction long before your eyes see their sign. 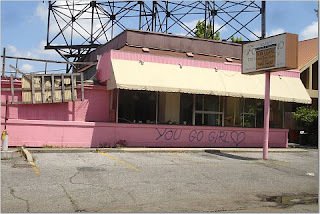 Inside, the place is a dive: no windows and the walls are covered in college sports teams’ memorabilia. We sit down at a table next to a framed newspaper clipping of President Bush. Apparently the President placed an order of ribs to-go so he could enjoy them on a flight. Image 1 thanks to psmyph according to this license. Image 2 thanks to rjones0856 according to this license. Image 3 thanks to Edgie168 according to this license.